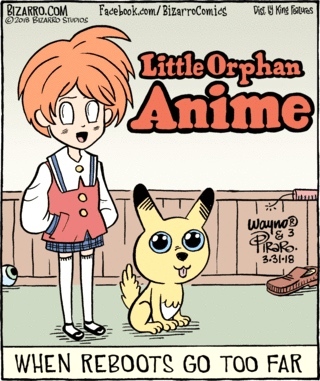 One of those pun / portmanteau things: Annie / anime pun or Little Orphan Annie + anime portmanteau (with /ǽni/ shared by the two contributors). In any case, the drawing shows a hybrid of (Little Orphan) Annie and (the conventions of) anime: the eyes and the hair especially. This entry was posted on March 31, 2018 at 5:49 am and is filed under Comic conventions, Linguistics in the comics, Portmanteaus, Puns. You can follow any responses to this entry through the RSS 2.0 feed. You can leave a response, or trackback from your own site.